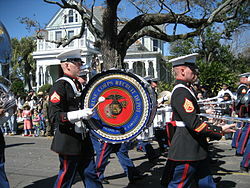 A bass drum is a large drum that produces a note of low definite or indefinite pitch. Bass drums are percussion instruments and vary in size and are used in several musical genres. Three major types of bass drums can be distinguished. The type usually seen or heard in orchestral, ensemble or concert band music is the orchestral, or concert bass drum (in Italian: gran cassa, gran tamburo). It is the largest drum of the orchestra. The kick drum, struck with a beater attached to a pedal, usually seen on drum kits. The pitched bass drum, generally used in marching bands and drum corps. This is tuned to a specific pitch and is usually played in a set of three to six drums. Using a shoulder harness so that the heads are vertical. On a floor stand as part of a drum kit. The heads are always vertical when mounted in this way. On an adjustable cradle. In this situation, the heads may be adjusted to any position between vertical and horizontal. It is possible for the bass drum to have a single cymbal mounted on it. A single heavy felt covered mallet (Fr. Mailloche; It. Mazza). When the drum is mounted vertically, the mallet above may be held in one hand and a rute held in the other. 2 matching bass drum mallets or a double headed mallet are used for playing drum rolls. When used as part of a drum kit, a variation of the mallet described above is mounted on a pedal and called a beater. The earliest known predecessor to the bass drum was the Turkish davul, a cylindrical drum that featured two thin heads. The heads were stretched over hoops and then attached to a narrow shell. To play this instrument, a person would strike the right side of the davul with a large wooden stick, while the left side would be struck a rod. When struck, the davul produced a sound much deeper than that of the other drums in existence. Because of this unique tone, davuls were used extensively in war and combat, where a deep and percussive sound was needed to ensure that the forces were marching in proper step with one another. The military bands of the Ottoman Janissaries in the 18th century were one of the first groups to utilize davuls in their music; Ottoman marching songs often had a heavy emphasis on percussion, and their military bands were primarily made up of davul, cymbal and kettle drum players. Davuls were ideal for use as military instruments because of the unique way in which they could be carried. The Ottoman janissaries, for example, hung their davuls at their breasts with thick straps. This made it easier for the soldiers to carry their instruments from battle to battle. This practice does not seem to be limited to just the Ottoman Empire, however; in Egypt, drums very similar to davuls were braced with cords, which allowed the Egyptian soldiers to carry them during military movements. The davul, however, was also used extensively in non-military music. For example, davuls were a major aspect of Turkish folk dances. In Ottoman society, davul and shawm players would perform together in groups called davul-zurnas, or drum and shawm circles. At its peak, the Ottoman Empire stretched from the Caucuses down to northern Africa and parts of the middle east. This long reach meant that many aspects of Ottoman culture, including the davul and other janissary instruments, were likely introduced to other parts of the world. In Africa, the indigenous population took the basic idea of the davul – that is, a two-headed cylindrical drum that produces a deep sound when struck – and both increased the size of the drum and changed the material from which it was made, leading to the development of the long drum. The long drum can be made a variety of different ways, but is most typically constructed from a hollowed out tree trunk. This is vastly different from the davul, which is made from a thick shell. Long drums were typically 2 meters in length and 50 centimeters in diameter, much larger than the Turkish drums on which they were based. The indigenous population also believed that the tree from which the long drum was made had to be in perfect shape. Once an appropriate tree was selected and the basic frame for the long drum was constructed, the Africans took cow hides and soaked them in boiling hot water, in order to stretch them out. Although the long drum was an improvement on the davul, both drums were nevertheless played in a similar fashion. Two distinct sticks were used on the two distinct sides of the drum itself. A notable difference between the two is that long drums, unlike davuls, were used primarily for religious purposes. As the use of the long drum began to spread across Europe, many composers and musicians started looking for even deeper tones that could be used in compositions. As a result of this demand, a narrow-shelled, single-headed drum called the gong drum was introduced in Britain during the 19th century. This drum, which was 70-100 centimeters in diameter and deep-shelled, was similar to the long drum in both size and construction. When struck, the gong drum produced a deep sound with a rich resonance. However, the immense size of the drum, coupled with the fact that there was not a second head to help balance the sound, meant that gong drums tended to produce a sound with a definite pitch. As a result, they fell out of favor with many composers, as it became nearly impossible to incorporate them in an orchestra in any meaningful way. Because they were unable to be used by orchestras, music makers began to build smaller gong drums that would not carry a definite pitch. This smaller version of the gong drum is today called orchestral bass drum, and it is the prototype with which people are most familiar today. The modern bass drum is used primarily in orchestras. The drum, similar to the davul and long drum, is double-headed, rod tensioned, and measures roughly 40 inches in diameter and 20 inches in width. Most orchestral bass drums are situated within a frame, which allows them to be positioned at any angle. Bass drums are also highly visible in modern drum kits. In 1909, William Ludwig created a workable bass drum pedal, which would strike a two-headed bass drum in much the same way as a drumstick. During the 1960s, many rock ‘n’ roll drummers began incorporating more than one bass drum in their drum kit, including The Who’s Keith Moon and Cream’s Ginger Baker. In a drum kit, the bass drum is much smaller than in the traditional orchestral use, most commonly 20 or 22 inches (51 or 56 cm) in diameter. Sizes range from 16 to 28 inches (41 to 71 cm) in diameter while depths range for 14 to 22 inches (36 to 56 cm), with 16 or 18 in (41 or 46 cm) being normal. The standard bass drum size of past years was 20 in × 14 in (51 cm × 36 cm), with 22 in × 18 in (56 cm × 46 cm) being the current standard. Many manufacturers are now popularizing the ‘power drum’ concept as with tom-toms, with an 18 in (46 cm) depth (22×18 in) to further lower the drum’s fundamental note. This is a misconception however, since the frequency of vibration and hence the fundamental note of a drum is determined by the diameter of the drum and not by the depth. The drum shell wall thickness, material and wood grain directions, because of alterations in the shell tension, also affects the fundamental note. The thinner wall in wooden ply constructed shells usually produces lower tone, because there are less horizontal grained wood, giving the shell less tension. A wider drum with a larger head would be capable of a lower tuning. Shorter drum shell, however, does not require as much force to vibrate the drum heads. Sometimes the front head of a kit bass drum has a hole in it to allow air to escape when the drum is struck for shorter sustain. Muffling can be installed through the hole without taking off the front head. The hole also allows microphones to be placed into the bass drum for recording and amplification. In addition to microphones, sometimes trigger pads are used to amplify the sound and provide a uniform tone, especially when fast playing without decrease of volume is desired. Professional drummers often choose to have a customized bass drum front head, with the logo or name of their band on the front. The kit bass drum may be more heavily muffled than the classical bass drum, and it is popular for drummers to use a pillow, blanket, or professional mufflers inside the drum, resting against the batter head, to dampen the blow from the pedal, and produce a shorter “thud”. Different beaters have different effects, and felt, wood and plastic ones are all popular. Bass drums sometimes have a tom-tom mount on the top, to save having to use (and pay for) a separate stand or rack. Fastening the mount involves cutting a hole in the top of the bass drum to attach it; “virgin” bass drums do not have this hole cut in them, and so are professionally prized. In many forms of music, the bass drum is used to mark or keep time. The bass drum makes a low, boom sound when the mallet hits the drumhead. In marches it is used to project tempo (marching bands historically march to the beat of the bass). A basic beat for rock and roll has the bass drum played on the first and third beats of a bars of common time, with the snare drum on the second and fourth beats, called back beats. In jazz, the bass drum can vary from almost entirely being a timekeeping medium to being a melodic voice in conjunction with the other parts of the set. As well as marking time as above, in some marching bands, the Bass Drum is used to give orders to the band e.g. 1 Stroke is used to order the band (and associated troops) to start marching. 2 Strokes is used to order the band to stop marching. Apart from the standard beaters mentioned above, implements used to strike the drum may include keyboard percussion mallets, timpani mallets, and drumsticks. The hand or fingers can also be used (it. con la mano). 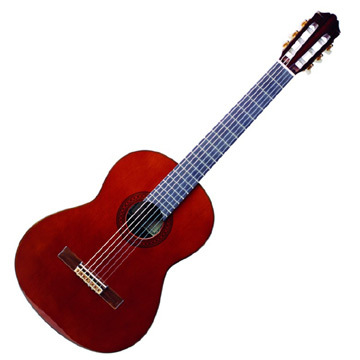 The playing techniques possible include rolls, repetitions and unison strokes. Bass drums can sometimes be used for sound effects. e.g. thunder, or an earthquake. 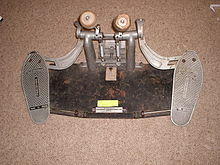 William F. Ludwig made the bass drum pedal workable in 1909, paving the way for the modern drum kit. 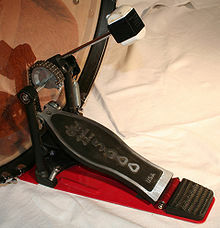 A bass drum pedal operates much the same as the hi-hat control; a footplate is pressed to pull a chain, belt, or metal drive mechanism downward, bringing a beater or mallet forward into the drumhead. The beater head is usually made of either felt, wood, plastic, or rubber and is attached to a rod-shaped metal shaft. The pedal and beater system are mounted in a metal frame and like the hi-hat, a tension unit controls the amount of pressure needed to strike and the amount of recoil upon release. 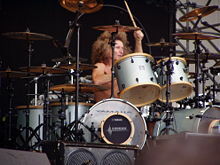 Tommy Aldridge pioneered the use of double bass drums in hard rock and heavy metal music. A double bass drum pedal operates much the same way only with a second footplate controlling a second beater on the same drum. Most commonly this is attached by a shaft to a remote beater mechanism alongside the primary pedal mechanism. One notable exception to this pattern is the symmetrical Sleishman twin bass drum pedal. When using a double bass drum pedal, the foot which normally controls the hi-hat pedal moves to the second bass drum pedal, and so the hi hat opens and remains open. A closed hi-hat sound can be more useful for some genres of music, so drummers use a drop clutch to keep the cymbals closed without use of the pedal. The most common method of bass drum playing is a “heel-up” technique: the pedals are struck with the ball of the feet using force primarily from the thigh as opposed to the ankles when using the “heel-down” technique. 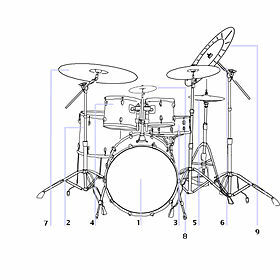 Most drummers play single strokes, although there are many who are also capable of playing doubles or diddles. Drummers such as Thomas Lang, Virgil Donati, and Terry Bozzio are capable of performing complicated solos on top of an ostinato bass drum pattern. Thomas Lang, for example, has mastered the heel-up and heel-down (single- and double-stroke) to the extent that he is able to play dynamically with the bass drum and to perform various rudiments with his feet. In order to play “doubles”, proponents of the “heel up” technique use either one of two techniques: the “slide technique” or the heel-toe technique. In the slide technique, the pedal is struck around the middle area with the ball of the foot. As the drum produces a sound, the toe is slid up the pedal. After the first stroke, the pedal will naturally bounce back, hit the toe as it slides upwards, and rebound for a second strike. In the heel-toe technique the foot is suspended above the foot-board of the pedal. The entire foot is brought down and the ball of the foot strikes the pedal. The foot snaps up, the heel comes off the footboard, and the toes come down for a second stroke. Once mastered either technique allows the player to play very fast double strokes on the bass drum. Noted players include Rod Morgenstein, Tim Waterson (who formerly held the world record for the fastest playing on a bass drum), Tomas Haake, Chris Adler, Derek Roddy, Danny Carey, Hellhammer. The technique is commonly used in death metal and other extreme forms of music. In certain types of heavy metal and punk, drummers play a constant stream of rapid-fire notes on the bass drum, and the ability to play evenly at extremely high tempos is a skill prized within the heavy metal scene. Many extreme metal, thrashcore and grindcore drummers use a combination of fast double bass drum patterns, the snare, and the cymbals to create blast beats. With two feet playing bass drum, many of the techniques of snare drum playing (such as rudiments and rolls) can be performed on the bass drums. In many forms of heavy metal and hard rock, as well as some forms of jazz, fusion, and punk, two bass drums are used (one operated by each foot) or a double-kick-pedal is used (two pedals on the same bass drum). One of the first people to popularize the use of the double bass drum setup was jazz drummer Louie Bellson, who came up with the idea when he was still in high school. 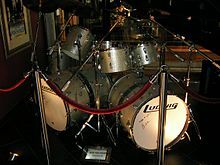 Also popularized by Keith Moon, Ginger Baker, and Billy Cobham, double bass drums were used initially by jazz artists such as Ray McKinley and Ed Shaughnessy in the 1940s and 1950s, and popularized in the 1960s by rock drummers Ginger Baker of Cream, Mitch Mitchell of the Jimi Hendrix Experience, Keith Moon of The Who and Nick Mason of Pink Floyd. Double bass drumming later became an integral part of many genres of heavy metal. For example, the heavy metal gallop. Carmine Appice, Ian Paice, Cozy Powell and Tommy Aldridge are among the double bass pioneers in metal music. American thrash metal band Slayer’s drummer Dave Lombardo earned title as “the godfather of double bass” from Drummer World, as well as American Crossover Thrash metal band D.R.I.’s drummer Felix Griffin who is considered one of the first Fathers of Crossover. Dave Lombardo, as well as other crossover, thrash metal, and thrashcore bands have cited Felix as one of the first pioneers. Revolution’s bass drums warm up in 2007.
melodic element to the percussion section. This is characteristic of the marching bass drum — its purpose is to convey complex rhythmic and melodic content, not just to keep the beat. The line provides impact, melody, and tempo due to the nature of the sound of the instruments. The bass line usually has from as many as seven bass drums to as few as two. But most high school drumlines consist of between 5 and 3. A bass line typically consists of four or five musicians, each carrying one tuned bass drum, although variations do occur. Smaller lines are not uncommon in smaller groups, such as some high school marching bands, and several groups have had one musician playing more than one bass drum, usually small ones, with one mounted on top of the other. The drums are typically between 16″ and 32″ in diameter, but some groups have used bass drums as small as 14″ and larger than 36″. The drums in a bass line are tuned such that the largest will always play the lowest note with the pitch increasing as the size of the drum decreases. Individually, the drums are usually tuned higher than other bass drums (drumset kick drums or orchestral bass drums) of the same size, so that complex rhythmic passages can be heard clearly and articulated. 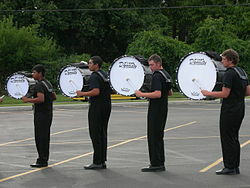 Unlike the other drums in a drumline, the bass drums are generally mounted sideways, with the drumhead facing horizontally, rather than vertically. This results in several things. First of all, to ensure that a vibrating membrane is facing the audience, bass drummers must face perpendicular to the rest of the band and so are the only section in most groups whose bodies do not face the audience while playing. Consequently, bass drummers usually point their drums at the back of the bass drummer in front of them, so that the drum heads will all be lined up, from the audience’s point of view, next to one another in order to produce optimal sound output. Since the bass drum is oriented differently from a snare or tenor drum, the stroke itself is different, but the fundamentals remain the same. As the article “Bass Drum” states, “your forearms should be parallel to the ground, bent at the elbows. The line between your shoulder and elbow should be vertical. Hold the mallet upward at a 45-degree angle. The hands hold bass mallets in such a way as to place the center of the mallet in the center of the head. The motion of the basic stroke is either similar to the motion of turning a doorknob, that is, an absolute forearm rotation, or similar to that of a snare drummer, where the wrist is the primary actor, or more commonly, a hybrid of these two strokes. Bass drum technique sees huge variation between different groups both in the ratio of forearm rotation to wrist turn and the differing views on how the hand works while playing. Some techniques also call for the use of fingers supporting the motion of the mallet by opening or closing, but no matter whether it is open or closed the thumb needs to be close to the rest of the fingers. However, the basic stroke on a drum produces just one of the many sounds a bass line can produce. Along with the solo drum, the “unison” is one of the most common sounds used. It is produced when all of the bass drums play a note at the same time and with a balanced sound; this option has a very full, powerful sound. It has a sort of pop when it is clean, and a more “fat” sound when dirty. The rim click, which is when the shaft (near the mallet head) is struck against the rim of the drum, either solo or in unison. Rimshots are rare on a bass drum and usually only happen on the top drums. A Rimshot is a sound that is produced when the stick hits the rim and the head of the drum at the same time. The different positions of the typical five person bass line each require different skills, though not necessarily different levels of skills. Contrary to the popular belief that “higher is better,” each drum has its own critical role to play. 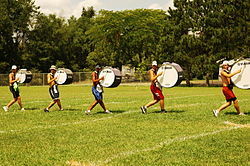 Bottom, or fifth bass, is the largest, heaviest, and lowest drum in the drumline. Consequently, it is used frequently to help maintain pulse in an ensemble and is thus sometimes referred to as the “heartbeat” of the group (the bottom bass was also often referred to as the “thud” bass in days gone by, indicating that many of their notes were the last one at the end of a phrase). Although this player does not always play as many notes as fast as other bass drummers (the depth of pitch renders most complex passages indistinguishable from a roll), his or her role is essential not only to the sound of the bass line or the drum line, but to the ensemble as a whole, especially in the case of parade bands. Fourth bass is slightly smaller than the bottom drum (generally two to four inches (102 mm) smaller in diameter) and can function tonally similarly to its lower counterpart, but usually plays slightly more rapid parts and is much more likely to play “off the beat” – in the middle rather than at the beginning or end of a passage. Third bass is the middle drum, both in terms of position and tone. Its function is usually that of the archetypical bass drum. This player plays an integral role in the actual rendering of complex linear passages. Second bass is known for having a job in the drumline. This player’s parts are very likely to be directly adjacent to the beginning or end of a phrase and less likely to be on a beat, which is highly counter-intuitive, especially to a new player. Sometimes this drum can function about the same as the top drum, but usually the second and top drummer function as a unit, playing very rudimentally difficult passages split between them. Top, or first, bass is the highest pitched drum in the bass line and usually starts or ends phrases. The high tension drum heads allow this player to play notes that are just as taxing as those of the snare line, and often the top bass will play a part in unison with the snare line to add some depth to their sound. There are a few different ways to properly muffle a marching bass drum. If the tuner uses generic weather-stripping type foam, start with medium density. If inexperienced or do not know how much foam to apply, the person should apply it to the outside of the head after he/she has put the head onto the drum. Once drum is tuned to the right pitch, make a note of how much foam was applied for future head changes. At that time, apply the foam to the inside of the head before its placed on the drum. This provides a cleaner look to the drumhead and will protect the foam from falling from the player’s beating and the environment. In a field show, bass drummers tend to turn to face either goal line. When standing on the 20 yardline, it can become difficult to see the drum major while facing the goal line. Or if the basses can’t dress a form facing one direction, they can turn the other way for that section. Turns can take place either in unison, or rippled for a different effect. For the lower basses it takes a lot more control to turn quickly. Cleaning turns for a bassline can be rather easy. They should lead with the shoulder at the start of the turn and lock the other direction on a specified count. Setting a check-point can help. For instance, one should be flat front on count two of the turn. However, note that the turn should be smooth and not jerky. A common problem may result from not stopping the weight of the drum at the end of the turn and letting the momentum get the better of the player. The solution to that problem involves tightening the core (abdominals and back muscles).